The Uinta Basin was considered Utah's last frontier. The Mormons sent out parties, to explore the area, and they took back reports that were not favorable. It was not until the government needed an area to house the Ute Indian (after the Meeker massacre) that soldiers were sent to the area around Myton. Myton was situated near a river making it a perfect spot for a new settlement. 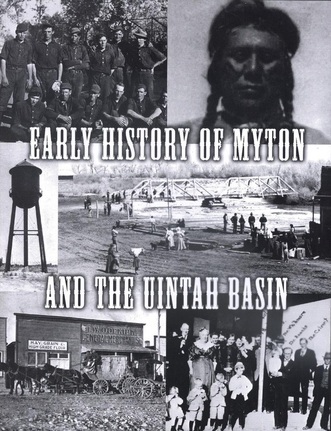 Alexia's book is full of interesting facts about the Uinta Basin and the establishment of Myton. It was not an easy beginning....and Myton remains small today. However, its history is rich with tales and this book is the best look you will get of how things happened in this small western town. Paperback, c2008, ii, 185 p. : ill. ; 21 cm. NOTE: The correct official spelling for Uinta Basin is without the 'h'. Many make the mistake of adding the 'h' at the end of Uinta, as in Uintah County. However, regardless of how it is used -- by itself or as part of a larger name -- Uinta Basin is only spelled correctly without the 'h'. See Informational Flyers for further information.